Heritage moments are great. I miss them whenever I watch TV. This is one of my favourite happenings from when I visited my dear friend Cube several years ago. Most Canadians I know have done this- probably because of Talking to Americans. I once convinced an American that Canada has no malls. The ice cream one went for well over an hour. Ah, a time before smartphones. I always found it easy to convince people of things even now that they have phones… most of them are still too stupid to look it up. Huh, I always imagined you as ginger. Also, not being able to do this with foreigners is probably the biggest downside to every move that America makes being broadcast in about ten different languages…. Sigh. I… I remember this differently. I totally knew you were messing with us! Mine was about timbits. How they’re small, squirrel-like mammals. 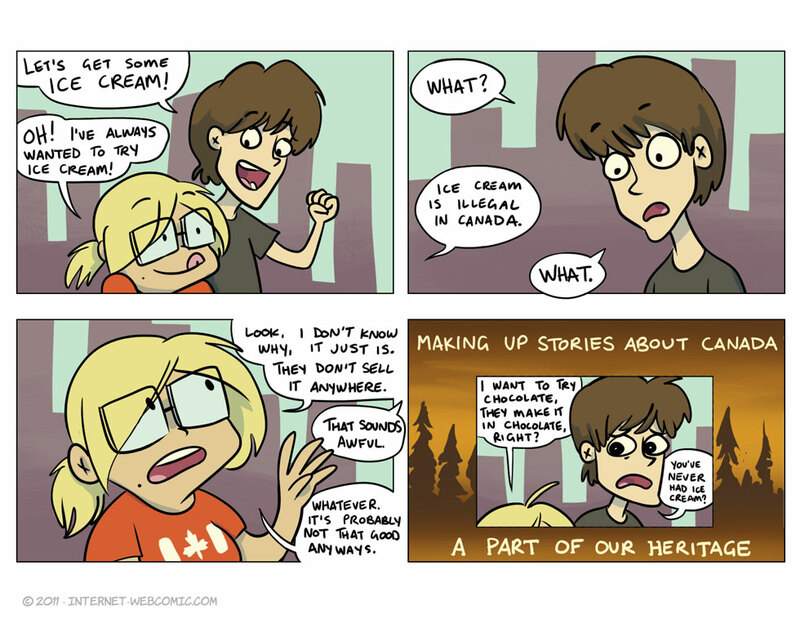 This comic tells many truths and is hilarious. nooooo that was suposed to come out asa cat!!!! Nah, you can’t pull it on people *from* Canada, we know way too much about America. It can only be Canadians pulling it on Americans. That’s just how it works. What about a former American citizen who, after having moved to Canada, tells their still American friends about “how everything is so different in Canada.” and ending every statement with “Eh” to really pile it on? Doubly acceptable! They’ll believe you more because you’re one of them. When I talk to Foreigners I inform them on the dangers of moose. Yea, well, when your 100 dollar bills smell like maple syrup, you can see why us Americans are surprised by some Canadian life. And if you think I am joking about the smell…. You’d think they’d say something about that in the official video from the Bank of Canada, or at least the Wikipedia page. Also, I’ve handled the bills before and they have no smell. Hmmm, well Wikipedia is never wrong so that made me do a little bit of digging. There doesn’t seem to be any super official listing stating that they are supposed to smell like maple, but but every semi official / non official statements say that it totally does smell like maple. At least when they first came out a while ago. So either the Canadia government is lying and covering it up the smell so the scent can keep sending signals to the filling in your teeth, or it has a distinct scent that people just happen to confuse with maple. That, or all the articles that I read were written by Canadian, and they were all in on the joke and they lied to me and SON OF A GUN DARN IT ALL TO HECK they tricked me again.